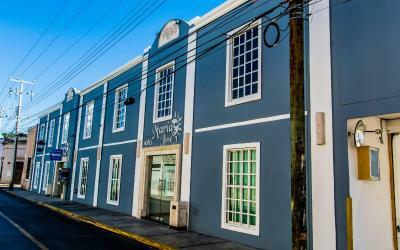 Lock in a great price for Hotel María Jose – rated 8.8 by recent guests! EXcelent staff. Location near Centro and especially Santa Lucia Parque. Nice pool and common areas. Very accommodating assistance when needed. Parking on site. 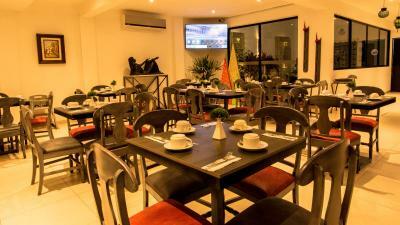 If you want comfort at a very good price near the Centro, consider this option very seriously. 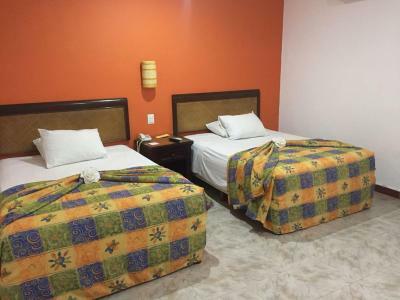 Nice size room, hot water shower, air conditioning, even a small kitchenette in my room, firm bed as is typical in Mexico, Basic free breakfast in the morning, pool with a bar. The best part for me though was location - you can easily walk to numerous restaurants, bars, parks & markets. Clean and friendly staff with a lot of helpful information- Thanks April. Very friendly and helpful staff. Great breakfast buffet. Very clean facilities in a great location. Fairly nondescript from the street, more upscale feel and vibe inside. Fundamentally well designed and laid out. Good parking. We were assisted at check-in by a charmingly quirky young lady who spoke rather good english, and the staff in general could not have been nicer Strong contender for most hotel we've ever gotten for the money, at least at the last minute...and during a fairly busy period. All the more so in consideration of the very solid breakfast buffet included. Large room. Nice, seemingly pristine pool area. They've checked the boxes well here. Our room being somewhat underfurnised is literally the only somewhat negative thing I can cite. Excellent choice for the budget traveler. Very clean, although linens and bedding are due for an upgrade. Good hot breakfast. Fast Internet. Staff very helpful. Beautiful clean building with helpful staff. Nice pool too. Great breakfast included with scrambled eggs a d fruit. Takes Visa. Good Internet. 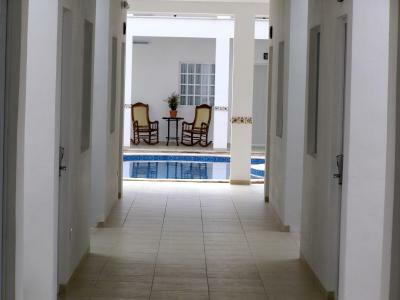 It is in great maintenance conditions, the staff is wonderfully kind and helpful, bedding is confortable, the rooms are spacious, all the place is so clean including the pool and its location is perfect to move all around the city. Very impressed with how comfortable our stay here was! Very nice staff and always very clean. It was better than some resorts I’ve stayed in. Amazing value! 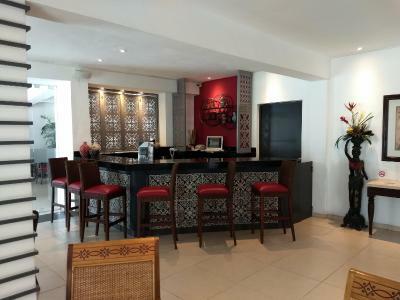 Hotel María Jose This rating is a reflection of how the property compares to the industry standard when it comes to price, facilities and services available. It's based on a self-evaluation by the property. Use this rating to help choose your stay! 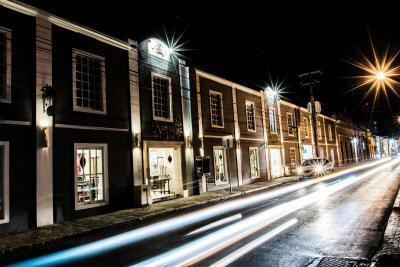 Hotel María José is located 2,300 feet from Merida Cathedral and main square. It offers an outdoor pool and free Wi-Fi. There is 24-hour reception and free on-site parking. 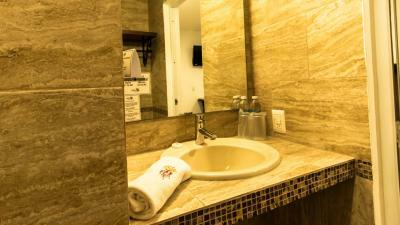 All rooms and suites are air conditioned and come with cable TV, a desk and wardrobe. Each has a private bathroom with a shower and free toiletries. Suites also have a sofa and a kitchenette with a fridge, microwave and coffee maker. 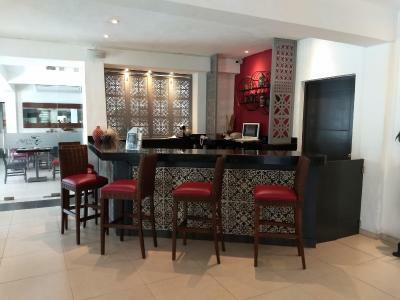 The hotel has a café-bar and offers room service. Currency exchange is offered at the tour desk and an airport shuttle service is available for an extra charge. 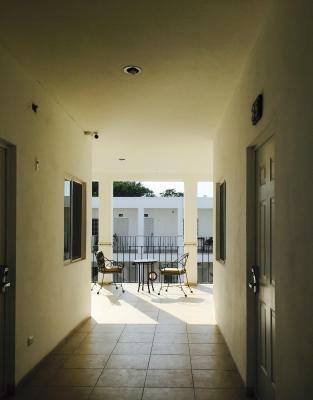 This is our guests' favorite part of Mérida, according to independent reviews. 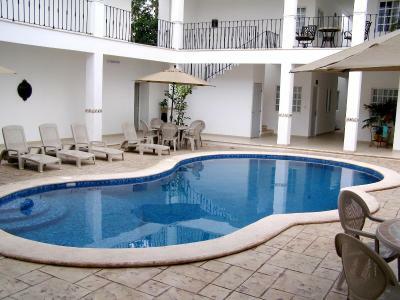 This property also has one of the top-rated locations in Mérida! Guests are happier about it compared to other properties in the area. 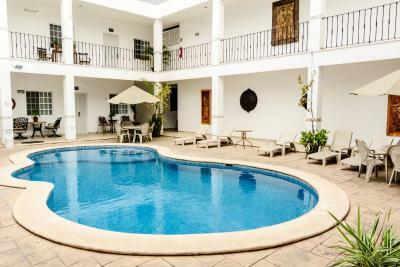 This property is also rated for the best value in Mérida! Guests are getting more for their money when compared to other properties in this city. 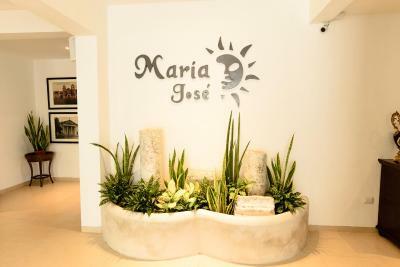 When would you like to stay at Hotel María Jose? 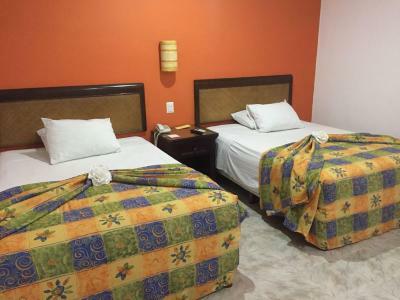 All rooms are air conditioned and come with free Wi-Fi, cable TV, a desk and wardrobe. Each has a private bathroom with a shower and free toiletries. 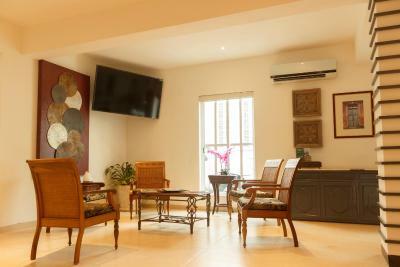 All suites are air conditioned and come with free Wi-Fi, cable TV, a desk and wardrobe. Each has a private bathroom with a shower and free toiletries. Suites also have a sofa and a kitchenette with a fridge, microwave and coffee maker. Stones from Mayan ruins were reused to build the colonial cathedrals and palaces of Merida's old city. House Rules Hotel María Jose takes special requests – add in the next step! Hotel María Jose accepts these cards and reserves the right to temporarily hold an amount prior to arrival. Please inform Hotel María Jose of your expected arrival time in advance. You can use the Special Requests box when booking, or contact the property directly using the contact details in your confirmation. One of the most picturesque neighborhoods in Mérida! 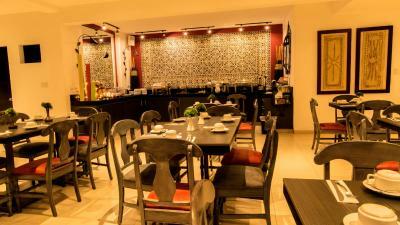 Good location, private parking is handy, friendly staff. Tasty breakfast. Quick wifi. Everything. We loved the staff, the breakfast is amazing, rooms comfortable and big and they have a nice pool. Would come back every time!! When we checked in we saw that we didn't get the room we'd asked for. I showed the clerk our hard copy confirmation. She told us that wasn't a picture of their hotel facilities and rooms so I brought up the digital copy. She couldn't argue with that. The room we got was supposed to have a kitchenette. It didn't. We finally decided on a room that made both parties happy but that wasn't how we wanted to start our stay there. Front desk staff could use a course in customer relations. Very good breakfasts and wait staff. Nice pool. Good location. Amazing towel art left on our bed. This hotel does not have a secure WIFI. There is a lobby bar and pool bar, but unused. No way to buy a cocktail after exploring the city or relaxing by the pool. Beautiful pool area, clean, Good buffet breakfast . Friendly staff. No soundproofing - I could hear music until quite late at night (even with earplugs in) and people talking in the hallways. It wasn't a major problem, though. Very nice hotel, much better than I was expecting for the price. Everything was immaculately clean and well kept. Excellent location as well, right in the city centre. The included buffet breakfast was decent as well, though the eggs and hash browns were cold by the time I went down (8:30). very noisy, impossible to sleep for 4 nights ... a hell !!! People listen to loud music in the common areas while it is forbidden and the hotel staff do nothing even after several complaints. the soundproofing of the rooms and more than deplorable and the bar next door does not help things. Room didn't feel particularly special and the kitchenette was a little dated. Sheets not very soft. Staff could have offered us more information about the local area and what was going on. A lot of tour groups come here so be aware of that. Same breakfast buffet every day. Nice offerings, but if you stay long(5 days for us) the comida tires on you. I loved everything about this hotel. It’s near the center of the city and there are a few good restaurants around. The hotel is clean. Towels seem a bit old. Restaurant only open until around midday. Great breakfast. Very friendly staff.